Not all fungi are microscopic. You can see mushrooms, mold and mildew, for example. 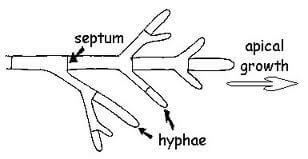 But most fungi feed through microscopic threads called hyphae. These threads dig into a food source, such as dead wood, bread, leaves or plants. They release chemicals that break down the food. Then the fungi digest it and use the nutrients. All about Fungi: Not all fungi are microscopic. For example mushrooms are fungi. 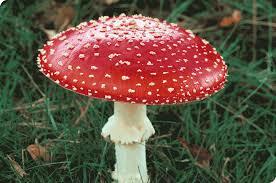 Fungi feed on dead animals, bird droppings, manure, wallpaper paste, fruit or even living animals. They’ll eat almost anything that was once alive. Most fungi is helpful. They break down dead matter. Consider them the planet’s clean-up crew. Some fungi can cause problems when they destroy clothing, books or food, or when they cause disease. Molds and mildews hurt growing plants. Some fungal diseases, such as athlete’s foot, hurt humans. Most fungi feed through microscopic threads called hyphae. These threads dig into a food source. Many types of mushrooms grow wild. Some of these are edible, but some are very poisonous. The Destroying Angel mushroom is a white mushroom poisonous enough to kill you. The yeast that makes bread rise is a kind of fungus. 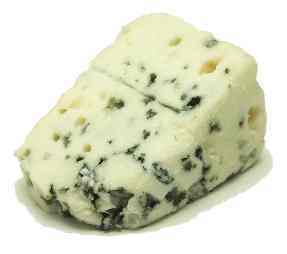 Penicillin is made from the blue mold, Penicillium. Penicillin is an antibiotic that can cure ear infections and other illnesses. Fungus is used to make cheese. Penicillin is made from the blue mold, Penicillium. A video explaining all about fungi. Question: How do fungi reproduce? Answer: Most fungi reproduce through fruiting bodies that release spores. 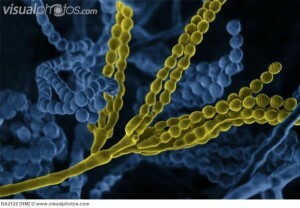 The spores are microscopic bodies that float through the air. When the spores land on food, they start to grow and eat the food. Enjoyed the Easy Science for Kids Website all about Fungi info? Take the FREE & fun Fungi quiz and download FREE Fungi worksheet for kids. For lengthy info click here. Declan, Tobin. " Fun Fungi Facts for Kids ." Easy Science for Kids, Apr 2019. Web. 23 Apr 2019. < https://easyscienceforkids.com/all-about-fungi/ >.